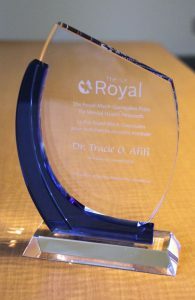 Dr. Tracie O. Afifi receives the Royal-Mach-Gaensslen Prize on October 24, 2018, in Ottawa. Left to right: Dr. Zul Merali (the Royal’s Institute of Mental Health Research), Dr. Chris Carruthers (Mach-Gaensslen Foundation), Dr. Afifi, Mitchell Bellman (Royal Ottawa Foundation for Mental Health) and Dr. Joanne Bezzubetz (the Royal). Tracie Afifi’s ground-breaking research shows how child abuse and neglect affects mental health throughout people’s lives, winning her the 2018 Royal-Mach-Gaensslen Prize for Mental Health Research. Tracie O. Afifi, PhD, a researcher at the University of Manitoba, is the latest recipient of the Royal-Mach-Gaensslen Prize for Mental Health Research, for her work highlighting the long-term consequences of child maltreatment on mental health. She has also studied mental health in service personnel and first responders, as well as problem gambling. Dr. Afifi was presented her prize at a public event entitled “Leaving a [Mental] Mark” on Wednesday, October 24, at the Royal Institute of Mental Health Research in Ottawa. And Dr. Afifi exemplifies that innovation. She spoke about her approach, using large databases of psychological survey information to find links between adverse childhood events, such as child abuse and neglect, and mental health outcomes. When she published a paper on outcomes of physical punishment of children in 2006, there was a view that spanking children was not harmful in the context of a warm and loving family. However, her study showed that physical punishment was associated with later depression and alcohol abuse, among other negative outcomes, even when the quality of parenting relationships was taken into account. Since then, her work has shown that harsh physical punishment — and even spanking on its own — increases the risk of many negative outcomes, including suicidal thoughts and attempts. Her team has found that the prevalence of previous child abuse in adult Canadians is 32% but 48% among those in the Canadian armed forces. One of her studies showed that child abuse has a greater effect on suicidal thoughts and attempts in military personnel than deployment-related trauma, but that experiencing both types of trauma creates a much greater risk. Panel discussion; from left to right: André Picard (the Globe and Mail), Dr. Afifi, Dr. Tracy Vaillancourt (University of Ottawa), Ron Ensom (consultant on child maltreatment) and Dr. Gail Beck (the Royal). Following Dr. Afifi’s talk, a panel of experts in effects of child maltreatment discussed the issue, guided by moderator André Picard, health reporter and columnist at the Globe and Mail. Joining Dr. Afifi were Dr. Tracy Vaillancourt, Canada Research Chair in School-Based Mental Health and Violence Prevention at the University of Ottawa; Ron Ensom, Ottawa-based social worker, clinician, researcher, and child maltreatment consultant; and Dr. Gail Beck, clinical director of the youth psychiatry program at the Royal. They discussed why it is important to repeal section 43 of the Criminal Code of Canada, which allows “physical correction” of children. Fifty-four other countries have banned spanking, but efforts to do so in Canada have been unsuccessful to date. Dr. Vaillancourt emphasized that bullying in schools also has a strong link with poor mental health and that Canada has one of the highest rates of bullying in the world. She emphasized that understanding long-term effects of experiences such as child maltreatment and bullying require following large groups of people for long periods. Dr. Afifi agrees. She plans to use the Royal-Mach-Gaensslen Prize to do more follow-up of a cohort of adolescents to understand what builds resilience in those who have been affected by child abuse and neglect. 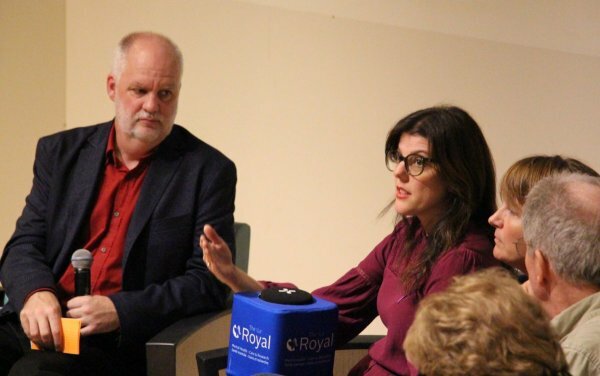 To learn more about her work, read the story on the website of our partner, the Royal’s Institute of Mental Health Research: Armed with evidence linking child maltreatment and mental illness, award-winning researcher explores new pathways towards prevention. 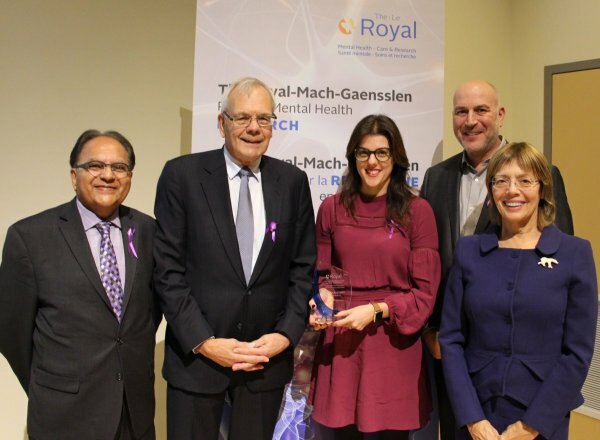 The Royal-Mach-Gaensslen Prize for Mental Health Research, established in 2015, celebrates early career researchers in the area of mental health and encourages them to continue their research in Canada. The $100,000 annual prize recognizes excellence in clinical research, innovative thinking, collaboration, imagination, and originality.